Capricorn One is a favorite movie of mine. If it’s on TV, particularly if it’s on widescreen, I can scarcely avoid it. It came out in 1978. I saw it the year it came out. It left a big impression on me. Part of my fascination was that there can be things that are stated are true that are not. Part of it is how resourceful, brave people can beat the odds if they try really hard, but that sometimes those same people end up getting killed for it. Also, that if you’re in the desert you can kill a snake and eat it raw. And that you could fake a landing on Mars, almost. And that it takes weeks to get to Mars. The film features a cast of characters of well known folks: Elliot Gould (a family favorite is the chilling Silent Partner, and he’s great in M*A*S*H. I think the coat he wears inspired my high school self a bit. Sam Watterson (years before Law & Order), OJ Simpson and Brenda Vacarro are all good. Also James Brolin: I was told I looked like him once–I think it was that I had a full beard at the time. Hal Holbrook, who I would see 22 years later in Mark Twain Tonight is really great as a man responsible for a giant lie. Holbrook makes you believe that there’s a righteous case to be made for lying to the American people. 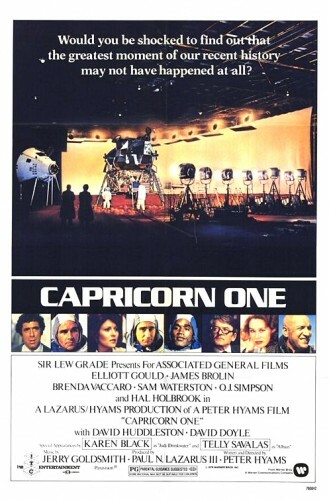 Capricorn One is the kind of movie that can only be fully appreciated if you consider the period that it was made, most notably in the years following both Vietnam and Watergate. Peter Hyams had worked as a reporter in Vietnam, where he became convinced that the government could conceal a great big lie if top officials wanted to do so. After all, Nixon had waged his “secret war” in Cambodia. Later revelations, such as the Church and Pike congressional investigations that revealed CIA plots to overthrow governments and kill Castro with exploding cigars and poisoned wetsuits, only added to anti-government paranoia. The movie reflects not only distrust of government, but also features the crusading reporter as hero; All the President’s Men, about Woodward and Bernstein and Watergate, had already been a hit movie two years earlier. If you haven’t seen it, it’s worth a viewing. Joe Crawford blogged this at 8:44am in 2010 in February. The 22nd was a Monday. You are reading this 9 years later. Comment. There are no comments Tweet. Send email. It has hashtags→ capricorn-one memories movies scifi .